What Book Shall We Read from Turkey? We’re happy to say that we received 7 suggestions from book club members this month 2 of which were randomly chosen to be included in the final list we’ll be voting on this month. Special thanks to all those who provided suggestions! But before we get to the vote, let’s talk about Turkish food. I always love exploring a city through its cuisine & was thrilled to find a couple of enticing cookbooks this month one of which inspired me so much that I’ve already made some of its recipes. “Take your pick of lively Turkish breakfasts; linger over delectable little plates of meze; try your hand at making breads and kebabs sold from the city's food carts, and master the art of making sweets such as baklava, helva and, of course, the unctuous Turkish delight.” The included meze is what really made me drool & the recipes I made were the Bulgurlu Köfte (a delicious veg version of a köfte—or ball—seasoned with spring onions & herbs) as well as Acılı Ezme (a spicy condiment flavored with pomegranate molasses & sumac) mopped up with toasted bread. 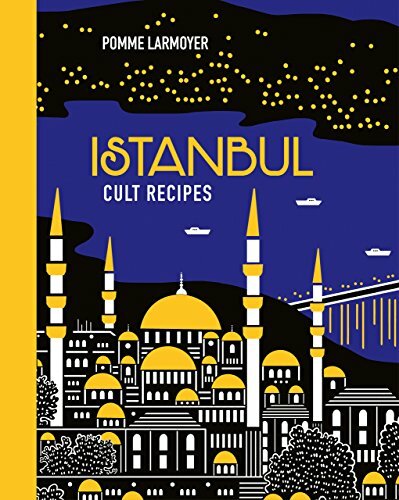 If you’re looking to explore Istanbul through its food, I highly recommend this cookbook!